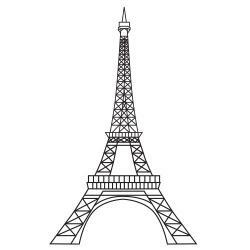 Using Eiffel Tower clipart can evoke immediate identification with both France as a whole, and Paris. For French teachers and several other professionals, Parisian images can enhance instruction and brighten up reports and presentations. For travelers, clipart can add a special touch to a photo album or scrapbook. You may be able to find an image of the Eiffel Tower, a French hat, or a baguette with a glass of wine in standard clipart collections that are delivered as part of some word processing software. 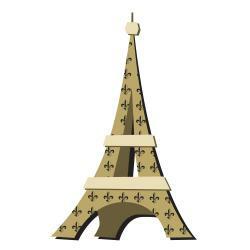 In addition, purchasing specialized collections of clipart to augment the free collection delivered with software often provides several additional French-themed images, such as the Eiffel Tower. It is often the case that purchased clipart is more refined in its look than the free collection. The clip art images available here are free to use. Simply save the image(s) of your choice to your computer and use them as you please for any non-commercial purposes. Windows users: Right click on an image and save to your hard drive. Mac users: Control + click on an image and save to your hard drive. Clipart ETC is provided by the Florida Educational Technology Clearinghouse and features several different views, and file sizes, of Eiffel Tower clipart. While the clipart can be used for free in educational settings (see license information on the website for details concerning how many images from this database can be used at once), using these free images for commercial purposes or to create obscene art is strictly prohibited. 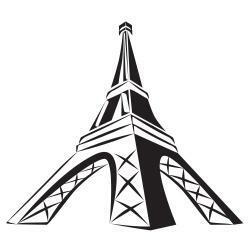 Coolclips has a considerable collection of whimsical Eiffel Tower images. While these images are strictly for personal use, they are a great option for anyone whose usage pattern fits their licensing agreement. Fotosearch, while not free, offers a wide range of prices on their images. Ranging from $15 to more than $100, this collection of Eiffel Tower images is very impressive, and may be worth checking out if you have even a small budget for your project requiring Paris photos. Images on this website are provided by various companies, meaning you have to check the license agreement for each company you purchase an image from. These French clipart images are easily recognizable as meaning to specifically refer to France. Whether you are a French teacher looking to decorate a classroom or other materials, or a traveler who would like to make a scrapbook of a trip to France, clipart images can really enhance the look of your project(s). The resources mentioned above are all good sources for Paris and the Eiffel Tower; in addition, all of the websites listed above offer additional French-themed images for all of your creative projects.